Sure, we’ve all had our share of hot chocolate, but this is the real deal – xocolatl is a drink enjoyed since the time of the Aztecs. It’s a hot chocolate, made only with the finest chocolate, enjoyed since the time of the Aztecs. It’s not a sweet drink, but rather a spicy drink – spiced with chili pepper. It’s not only incredibly tasty and savory, but it’s also very healthy, doing wonders for your heart and soul. Here’s a basic recipe, or if you really want to make it sweet, you can also use this recipe. Depending on where you’re from, mulled wine can be the most common thing, or the strangest thing. Mulled wine (or Glühwein in German speaking countries) is basically boiled wine – you take red wine (or sometimes white) and boil it with spices, maybe some sugar, oranges, raising… there are endless variations to this beverage – all equally delicious and warming. Mulled wine is popular in many parts of Europe during Christmas, but many people (including myself – guilty!) enjoy it throughout all the cold season. I really like Jamie Oliver’s mulled wine recipe, though it’s quite complicated and requires many spices. The simples recipe is just with wine, a touch of honey or sugar and some cinnamon sticks, to which you can add (to your heart’s content) ginger and some very thin slices of oranges or lemons. Sachlav, sahlab, salep, or saloop (depending upon where you are) is the quintessential warm winter drink Israeli region. It’s basically their equivalent of a hot chocolate. Believe it or not, this drink is actually made from a type of orchid, which means it can be quite difficult to replicate at home; however, you can get a very similar taste by replacing it with a mix of rosewater, cornstarch, vanilla and shredded coconut – yummy! Here’s the suggested recipe. Grog has been used for so long and by so many people that today, the word can mean many things. It means anything alcoholic in Australia, mixed drinks in Swede, but in most parts of the world, Grog is a hot beverage made with lemon juice (or any other citrus), sugar, cinnamon and rum. Another version of grod involves mixing black tea with rum and some (of course, black) sugar. The name “grog” probably came from the nickname of Admiral Vernon, who was known as “Old Grog” because he wore a grogram cloak. The beverage was consumed in abundance by pirates; long voyages were quite common, but the water kept in barrels often developed algae or turned slimy. In order to make it safer and easier to drink, sailors added some rum and lemon juice. Thankfully, today we can drink this much tastier and healthier version of grog. Bajigur is a lesser known drink from the Java area, in Indonesia. The main ingredients are coconut milk and Aren palm sugar; usually to add taste, they also add just a pinch of ginger and a pinch of salt. 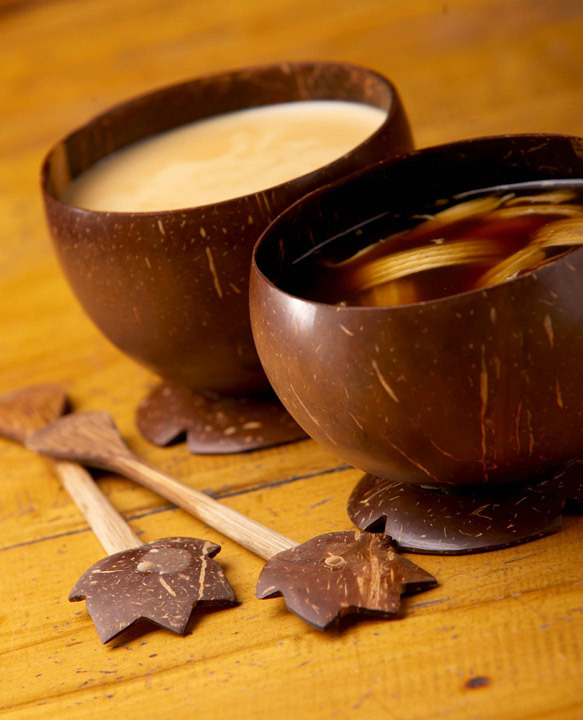 While this is nowhere nearly one of the most common hot drinks in the world, I find that the exotic taste very pleasant, and it just seems to warm you up instantly. Definitely a choice for those rainy days when you just want to relax and stay warm. Here’s the basic recipe. Matcha literally means powdered green tea. Though rarely seen (or savored) outside of Asia, Matcha is definitely one of the most interesting drinks you can try. You can make it thinner or thicker, to your taste, but keep in mind that the drink is usually very bitter and requires some sweetener. Find out more about match and its preparation techniques on Wikipedia. You can also enjoy it with a marshmallow or some latte. You can travel all the way to Mexico with this delicious drink – Atole contains hot corn and masa, a type of dough. There’s also a chocolate version, called champurrado, and other versions are flavored with fruits or nuts. While fruits and chocolate are optional, some sweetening, vanilla and cinnamon are musts if you truly want to enjoy the true flavor of Atole. Now we’re getting into the really heavy stuff! Also known as po cha, butter tea is traditionally served in Tibet, Nepal, Bhutan, and Buddhist minorities in India. It is made by mixing tea, fat butter and salt. The reasoning behind this is that the mixture of tea and butter keeps you extremely hot, and protects you from the outside cold; needless to say, in areas like Nepal, that’s a godsend. ince butter is the main ingredient, the drink provides plenty of caloric energy and is particularly suited to high altitudes. The butter may also help prevent chapped lips. Rakia itself is a lesser known drink to most people – though very popular in many countries in central and Balkan Europe (with the Tuica variation in Romania). Rakia is a type of plum brandy, which can be more or less strong; if it’s less strong, you can boil it and mix it with some black pepper and honey or sugar. It turns into a really strong, tasty and hot drink – savor it with care.